With multiple direct appeals to the many criminals who presumably were taking a break from breaking into cars to stave off the dopesickness to watch the State of the State address, Gov. Michael J. Dunleavy made crime-fighting the key promise of the night. He’s pledging additional resources for the criminal justice system, opening courts on Fridays (which is ultimately up to the court system) and a repeal and replace effort for the criminal justice bill Senate Bill 91, with legislation set to be introduced today. He also made a glancing pledge of additional resources for substance abuse treatment. Jokes aside, it will be interesting to watch how the governor navigates between the reality of criminal justice reform and the politics of the situation. There are certainly areas where the two align—and the Legislature has already passed updates to Senate Bill 91—but Senate Bill 91 has become an easy target for a rise in crime that many would also peg to the state’s economy, budget cuts and opioid crisis. The amendments will come as resolutions, which need two-thirds of the Legislature to put on the ballot (27 in the House and 14 in the Senate). Tuesday was Day 8 of the session, which means speaker pro tempore Neal Foster had to call for nominations for a permanent speaker. Republicans put forward Rep. Dave Talerico, who failed on an expected 20-20 vote, and Democrats put forward Rep. Bryce Edgmon, who was withdrawn after Talerico’s nomination went down. That was it for the day. Rep. Gary Knopp, the Kenai Republican who left the Republicans to push for a bipartisan majority, reaffirmed his support for a bipartisan majority and said he would not be voting for either candidate. That would mean Edgmon would have got just 19 votes to Talerico’s 20, which explains the decision to withdraw the nomination. It’s not the biggest revelation in the world—especially when Tangeman didn’t give a ballpark of when taxes would be needed—but it serves as a window into the long-term thinking of some folks in the administration when it comes to the future of oil production in Alaska. Tangeman also discussed the AKLNG project, saying that it’s the administration’s hopes to bring the big three producers back on with the project. He said there’s concern about the state shouldering 100 percent of the risk. The confirmation hearing of Department of Administration Commissioner John Quick was comparatively uneventful, at least from the parts that we heard. There was some attention paid to his previous jobs, but if there’s anything there to set off red flags, then no one was tipping their hands. It should be noted that no public testimony was taken on either appointee. The Senate Labor and Commerce Committee was set to take public testimony on Department of Commerce, Community and Economic Development Commissioner Julie Anderson, but the hearing was cancelled. Public testimony is on the agenda today for Department of Health and Social Services Commissioner Adam Crum at 1:30 p.m. in the Senate Health and Social Services Committee and for Department of Natural Resources Commissioner Corri Feige at 3:30 p.m. in the Senate Resources Committee. 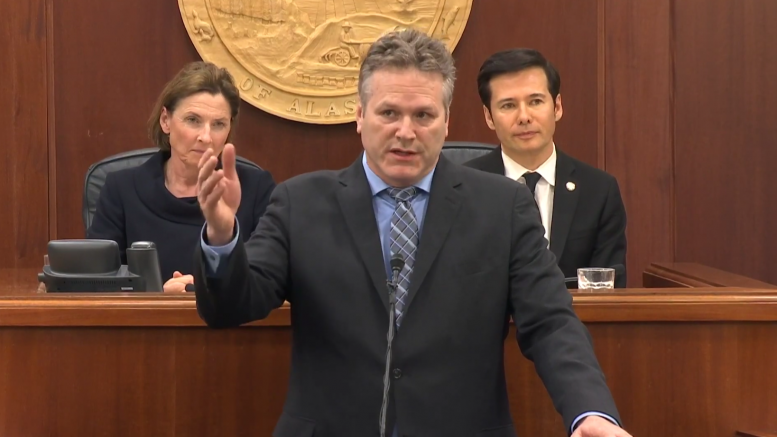 Be the first to comment on "AKLEG Recap Day 8: Dunleavy proposes three constitutional amendments, declares ‘War on Criminals’"